Thought I will take a break from what I am doing right now to jot this down this post. I woke up from a short afternoon nap earlier today to get back to the edits of the book. I could hear the sounds of the door opening. Banu, our cook and house help, had come to work. I tried to tiptoe to the study but had to cross the kitchen. She caught me, "dhania powder khatam ho gaya, drawer main bhi oongi hain" (coriander is over, there are ants in the cupboard). I nodded quietly, opened the fridge, not really wanting to get caught in her chatter. She had kept my post nap nimbu pani ready. I headed to the study and opened my comp and began typing. I worked for a bit. The topic was mutton masala at a Malvani restaurant. This reminded me of some work I had in the kitchen. I went there and marinated the mutton pieces that Banu had washed and kept, and chicken wings too, for me to cook tomorrow. She took out something from the fridge and said 'hara phool saad gaya' (the green flower has rotted). She had a broccoli in her hand. I went back to the study to work. Then Banu suddenly appeared by my desk. The alu parathas I had requested her to make for my evening snack were ready. 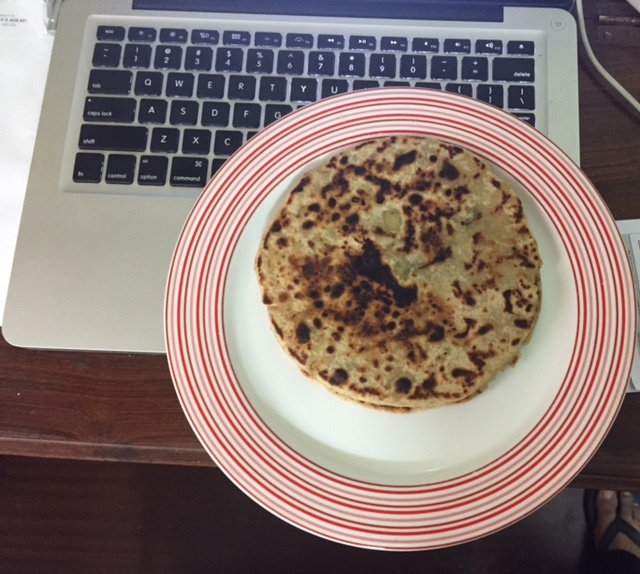 I went to the hall to take a break from writing and to eat the parathas. Banu took the opportunity to tell me about how none of her other employers can reach her on phone when she is at our place, due to the poor phone signal here, and scold at her because of that. I looked down at my phone, while she chatted on, and whatsapped a friend to check about the owner of a restaurant I was writing about for me to fact check. My lack of response didn't deter Banu though as she began to tell me about how she had cooked the keema for tomorrow's lunch differently. "This time I added the raw spices and onion to the keema and put it all in the pressure cooker. That's how we make salan". I looked at her and said, "you told me the gas is over so I just booked it""
"No, no, bhabi (K) showed me that the batla (gas cylinder) is there. So we don't need it". I frantically messaged K about this. K had to work from home today too but she smartly went to a local cafe to do so. K replied, "You and Banu are like Tom and Jerry. Always making a pickle when you don't need to. PS: In case my editor(s) is (are) reading, I was just taking a break and will get back to work.